Cut zucchini into long sticks, about 3 inches long. Microwave zucchini for about 3 minutes. Pat zucchini sticks dry with a paper towel. Mix eggs and water together in a small bowl. Mix cheese, bread crumbs and herbs together in another small bowl. Dip zucchini sticks first into the egg mixture and then into the bread crumb mixture. Arrange zucchini in rows on a metal baking sheet that has been sprayed with cooking spray. Broil zucchini sticks for about 12 to 15 minutes, turning once while cooking. 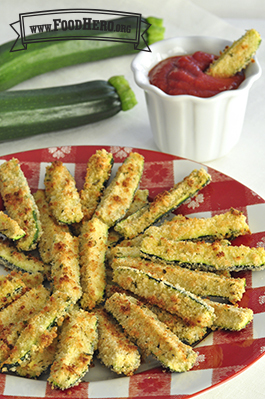 1 Comments for "Baked Zucchini Sticks"
These are for sure one of my families FAVORITE Food Hero Recipes ever!!! So amazinly yummy. Of note we had extra batter/egg mixture so I also made some mushrooms - YUMM! They did cook less than indicated in the recipe so be sure to watch them and if possible use the low setting on the broiler.